Infective endocarditis is an inflammatory and proliferative disease of the endocardium that affects mainly the valves. Fungal etiology is relatively uncommon and is associated with high mortality especially if it is not treated early. It usually occurs in the presence of predisposing factors like immunocompromised state, use of endovascular devices, and previous reconstructive cardiac surgery. Most common fungal species causing infective endocarditis are Candida and Aspergillus, and they are usually associated with bulky vegetation. Kodamaea ohmeri is ascosporogenic yeast, formerly classified in the genus Pichia. The genus Kodamaea currently comprises five species: K. anthrophila, K. kakaduensis, K. laetipori, K. nitidulidarum, and K. ohmeri. The latter one is pathogenic to plants and is used in food industry for fermentation. It rarely causes infections in human beings also. Till date, only 20 cases were reported in the literature out of which only 3 were neonates and only 1 was a native valve endocarditis. We report a 40-day-old neonate with nosocomial native valve endocarditis due to K. ohmeri. A 40-day-old male baby, one among the twins, born of normal vaginal delivery at the 36 th week of gestation, was referred to our institute for the management of tricuspid valve mass. Twenty days prior to that, the baby was admitted in a neonatal intensive care unit of another tertiary care hospital for evaluation and management of neonatal seizures and necrotizing enterocolitis. Blood cultures done there were negative. Baby was managed there with anti-convulsants and intravenous antibiotics, which included piperacillin tazobactam combination along with amikacin for necrotizing enterocolitis through peripheral venous access. No invasive procedures were done there during the stay. Echocardiography done there to rule out any structural heart disease revealed a tricuspid mass and was referred to our centre for further management. On admission baby was not febrile but deeply icteric. There were no focal neurologic deficits or clinical heart failure. Clinical cardiovascular examination was normal. There was a small cephalhematoma of size 3 Χ 2 cm over the scalp. Computed tomography brain scan showed small petechial hemorrhages, but no space occupying lesions. Echocardiography showed 11.1 Χ 6.4 mm vegetation attached to the tricuspid valve and Doppler examination showed a mean tricuspid inflow gradient of 5 mmHg [Figure 1]. Under sterile precautions, four blood cultures were collected from different sites on two consecutive days. All four blood cultures were positive by the BacT Alert 240-bioMerieux Marcy l'Etiole system (France) and the fungal cultures grew white yeast-like colonies. The organism was identified as K. ohmeri by using the card type "YST" on the Vitek 2 compact system (bioMerieux). Gram staining showed oval budding yeast cells. Antifungal susceptibility test was done by tube dilution method, following the standard method of NCCLS M38A. MIC of the anti-fungal agents were Amphotericin <0.25 mcg/L, Fluconazole 2 mcg/L, Voriconazole <0.12 mcg/L, and Flucytosine <1mcg/L. Results showed that the organism was susceptible to the available anti-fungal agents. The baby was started on intravenous amphotericin B at the dose of 1 mg/day and other supportive measures including packed cell transfusion and was planned for surgical removal of the mass after a few days of antifungal therapy. However, the baby abruptly developed hemodynamic compromise on the second day after initiation of antifungal therapy due to fungal septicemia and could not be resuscitated. K. ohmeri, which is a very rare human pathogen, with only 20 cases reported in the literature, so far. Even rare is the native valve endocarditis due to this organism. Fungi are classified primarily based on the structures associated with sexual reproduction, which tend to be evolutionarily conserved. However, many fungi reproduce only asexually, and cannot be easily placed in a classification based on sexual characters; some produce both asexual and sexual states. These problematic species are often members of the Ascomycota, but may also belong to the Basidiomycota. At present, the International Code of Botanical Nomenclature permits mycologists to give asexually reproducing fungi (anamorphs) separate names from their sexual states (teleomorphs). 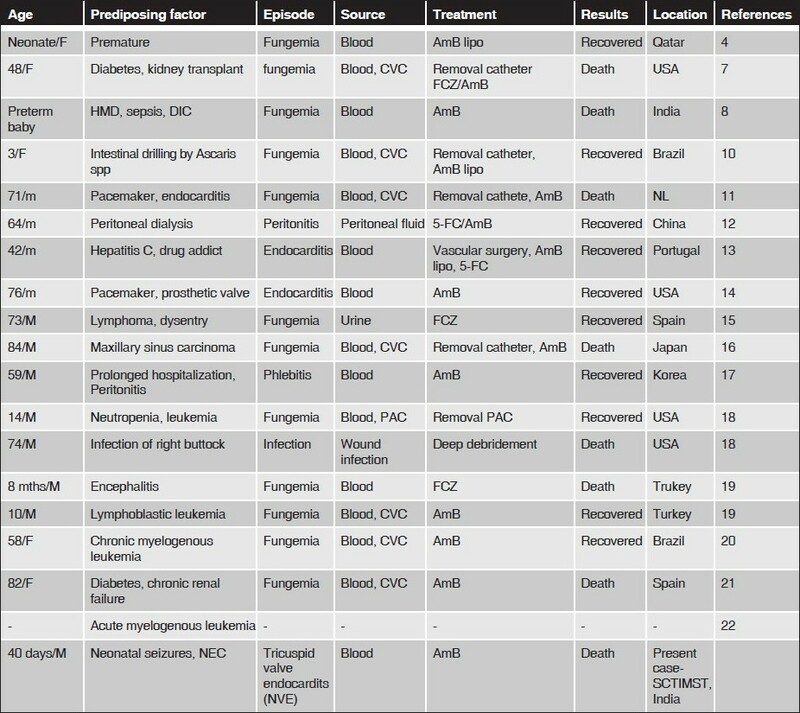 Cases so far reported [Figure 2] are from immunocompromised hosts with presence of invasive devices. It was first isolated in a 48 year old, diabetic, female patient. In India, this is the second case, other case being a preterm baby with hyaline membrane disease. K. ohmeri infection responds to the removal of the devices, catheter, etc., as it is mostly associated with invasive devices, Out of the three neonatal infections described so far, one responded to the removal of the catheter without antifungal treatment,  one responded to liposomal amphotericin-B, and the other baby succumbed to disseminated intravascular coagulation. In our patient, the immunocompromised status of the preterm infant with high dependence state in the hospital and multiple intravenous injections and the hospital environment have contributed to the pathogenesis of the infection. To conclude, infections caused by these rare organisms are identified more frequently. It occurs in a broad range of patient categories including children and newborn (our present case). But the actual incidence is difficult to estimate because of unawareness of this rare species. Since this pathogen readily responds to early removal of the infected catheter or other source of infection, early diagnosis could save the life of the patients especially in the immunocompromised and newborn. We would like to thank the support given by Dr Kavita Raja, Professor and Head of the department, Department of Microbiology, SCTIMST. 1. Joao L, Duarte J, Cotrim C, Rodrigues A, Martins C, Fazendas P, et al. Native valve endocarditis due to Pichia ohmeri. Heart Vessels 2002;16:260-3. 2. Anaissie EJ, Bodey GP, Rinaldi MG. Emerging fungal pathogens. Eur J Clin Microbiol Infect Dis 1989;8:323-30. 3. MycoBank. Fungal Databases Nomenclature and Species Banks Online Taxonomic Novelties Submission. Utrecht, Netherland: c2004. p. 9. 4. Taj-Aldeen SJ, Doiphode SH, Han XY. Kodamaea (Pichia) ohmeri fungaemia in a premature neonate. J Med Micorobiol 2006;55:237-9. 5. Patted SV, Halkati PC, Yavagal ST, Patil R. Candida Krusei infection presenting as a right ventricular mass in a two month old infant. Ann Pediatr Cardiol 2009;2:170-2. 6. The Centralbureau Voor Schimmelcultures (CBS) Yeasts Database. Utrecht, Netherland: CBS Fungal Biodiversity Centre; c2009. 7. Bergman MM, Gagnon D, Doern GV. Pichia ohmeri fungemia. Diagn Microbiol Infect Dis 1998;30:229-31. 8. Poojary A, Sapre G. Kodamaea ohmeri Infection in a Neonate. Indian Pediatr 2009;46:629-31. 9. Lee JS, Shin JH, Kim MN, Jung SI, Park KH, Cho D, et al. Kodamaea ohmeri isolates from patients in a University Hospital: Identification, antifungal susceptibility and pulsed field gel electrophoresis analysis. J Clin Microbiol 2007;45:1005-10. 10. De Barros JD, Do Nascimento SM, De Araújo FJ, Braz Rde F, Andrade VS, Theelen B, et al. Kodamaea (Pichia) ohmeri fungemia in a pediatric patient admitted in a public hospital. Med Mycol 2009;47:775-9. 11. Matute AJ, Visser MR, Lipovsky M, Schuitemaker FJ, Hoepelman AI, et al. A case of disseminated infection with Pichia ohmeri. Eur J Clin Microbiol Infect Dis 2000;19:971-3. 12. Choy BY, Wong SS, Chan TM, Lai KN. Pichia ohmeri peritonitis in a patient on CAPD: Response to treatment with amphtericin. Perit Dial Int 2000;20:91. 13. João I, Duarte J, Cotrim C, Rodrigues A, Martins C, Fazendas P, et al. 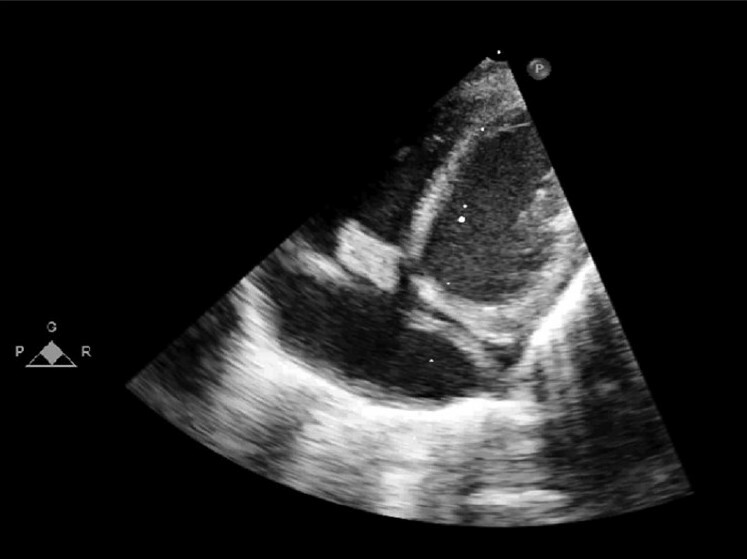 Native valve endocarditis due to Pichia ohmeri. Heart Vessels 2002;16:260-3. 14. Reina JP, Larone DH, Sabetta JR, Krieger KK, Hartman BJ, et al. Pichia ohmeri prosthetic valve endocarditis and review of literature. Scand J Infect Dis 2002;34:140-1. 15. Puerto JL, García-Martos P, Saldarreaga A, Ruiz-Aragón J, García-Agudo R, Aoufi S, et al. First report of urinary tract infection due to Pichia ohmeri. Eur J Clin Microbiol Infect Dis 2002;21:630-1. 16. Hitomi S, Kumao T, Onizawa K, Miyajima Y, Wakatsuki T, et al. A case of central-venous-catheter-associated infection caused by Pichia ohmeri. J Hosp Infect 2002;51:75-7. 17. Shin DH, Park JH, Shin JH, Suh SP, Ryang DW, Kim SJ, et al. Pichia ohmeri fungemia associated with phlebitis: Successful treatment with amphotericin B. J Infect Chemother 2003;9:88-9. 18. Han XY, Tarrand JJ, Escudero E. Infections by the yeast Kodamaea (Pichia) ohmeri: Two cases and literature review. Eur J Clin Microbiol Infect Dis 2004;23:127-30. 19. Otag F, Kuyucu N, Erturan Z, Sen S, Emekdas G, Sugita T, et al.An outbreak of Pichia ohmeri infection in the paediatric intensive care unit: Case reports and review of the literature. Mycoses 2005;48:265-9. 20. Ostronoff F, Ostronoff M, Calixto R, Domingues MC, Souto Maior AP, Sucupira A, et al. Pichia ohmeri fungemia in a hematologic patient: An emerging human pathogen. Leuk Lymphoma 2006;47:1949-51. 21. García-Tapia A, García-Agudo R, Marín P, Conejo JL, García-Martos P, et al. Kodamaea ohmeri fungemia associated with surgery. Rev Iberoam Micol 2007;24:155-6. 22. Mahfouz RA, Otrock ZK, Mehawej H, Farhat F. Kodamaea (Pichia) ohmeri fungaemia complicating acute myeloid leukaemia in a patient with hemochromatosis. Pathol 2008;40:99-101. 23. Kingo AR, Smyth JA, Waisman D. Lack of evidence of amphotericin B toxicity in very low birth infants treated for systemic candidiasis. Pediatr Infect Dis J 1997;16:1002-3. 24. Knoppert D, Salama HE, Lee DS. Eradication of severe neonatal systemic candidiasis with amphotericin B lipid complex. Ann Pharmacother 2001;35:1032-6. Authors of Document Yuan, S.-M.
Xiao, Y. and Kang, M. and Tang, Y. and Zong, Z. and Zhang, Y. and He, C. and Deng, Y. and Fan, H. and Xie, Y.
Chakrabarti, A., Rudramurthy, S.M., Kale, P., (...), Singhi, S., Rao, K.L.N.